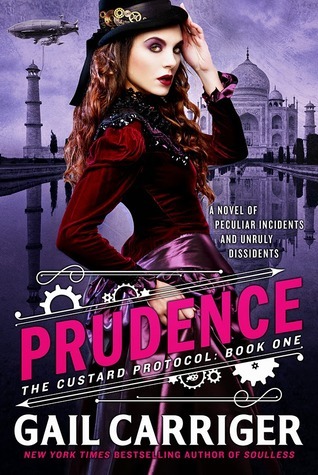 When Prudence Alessandra Maccon Akeldama (Rue to her friends) is given an unexpected dirigible, she does what any sensible female would under similar circumstances - names it the Spotted Custard and floats to India in pursuit of the perfect cup of tea. But India has more than just tea on offer. Rue stumbles upon a plot involving local dissidents, a kidnapped brigadier's wife, and some awfully familiar Scottish werewolves. Faced with a dire crisis and an embarrassing lack of bloomers, what else is a young lady of good breeding to do but turn metanatural and find out everyone's secrets, even thousand-year-old fuzzy ones? I doubt I'll ever get tired of Carriger's world. It is filled with such interesting characters and adventurous storylines with tons of whimsy thrown in for good measure. The Custard Protocol follows the escapades of Prudence Alessandra Maccon Akeldama, the daughter of Alexia Tarabotti (a soulless preternatural who can "turn-off" a supernatural being's powers with a single touch) and Conall Maccon (a werewolf). Prudence, herself, is quite interesting. She has an excess of soul, and upon her birth showed some very interesting traits. As a metanatural, she can "borrow" the powers of an supernatural she touches. A touch from a vampire makes her a vampire, and so on. But being the daughter of Alexia and Conall, and the adopted daughter of vampire Lord Akeldama, gives her a lot of gumption and sass. She is not a young lady that wants to sit on the sidelines. When Lord Akeldama discovers a new tea, he sends his adopted daughter across the world to India to corner the market. But of course it's not going to be a simple trip. Chaos quickly ensues, and Prudence, along with her traveling companions, find out that the supernatural world is much more interesting than they previously believed. Here's the thing...while you don't necessarily have to have read the preceding series to understand who Prudence is and what is happening in the story, you definitely miss out on some of the fun. Carriger does an amazing job weaving characters in and out, and part of the fun is following that path and discovering the connections.